Bursitis is inflammation of the fluid-filled sac (bursa) that lies between a tendon and skin, or between a tendon and bone. The condition may be acute or chronic. Bursae are fluid-filled cavities near joints where tendons or muscles pass over bony projections. They assist movement and reduce friction between moving parts. Regan WD, Grondin PP, Morrey BF. Elbow and forearm. In: DeLee JC, Drez D Jr, Miller MD, eds. DeLee and Drez’s Orthopaedic Sports Medicine. 3rd ed. Philadelphia, Pa: Saunders Elsevier; 2009:chap 19. Shah A, Busconi B. Hip, pelvis, and thigh. In: DeLee JC, Drez D Jr, Miller MD, eds.DeLee and Drez’s Orthopaedic Sports Medicine. 3rd ed. Philadelphia, Pa: Saunders Elsevier; 2009:chap 21. Wapner KL, Parekh SG. Foot and ankle. In: DeLee JC, Drez D Jr, Miller MD, eds.DeLee and Drez’s Orthopaedic Sports Medicine. 3rd ed. Philadelphia, Pa: Saunders Elsevier; 2009:chap 25. Schmidt MJ, Adams SL. Tendinopathy and bursitis. In: Marx JA, ed. Rosen’s Emergency Medicine: Concepts and Clinical Practice. 7th ed. Philadelphia, Pa: Mosby Elsevier; 2009:chap 115. Inflammation causes the knee to become tender and swollen, making it difficult and painful to move the joint. The knee has 15 bursae, fluid-filled sacs that act as shock absorbers and protect the bones, joints and tendons from the harm friction can cause. The prepatellar bursa, is located in front of the kneecap (patella). When this becomes inflamed, as the result of repeated friction between the skin and patella, it's known as prepatellar bursitis. Along with the bursa becoming tender and swollen, complications can arise when fluid within the bursa becomes infected, causing the area to become red, hot and painful. Friction between the skin and the patella can be caused by someone spending a lot of time on their knees, doing repetitive movements. Inflammation can also occur as the result of injury, infection or an underlying inflammatory condition. However, often it's not clear why someone has developed a prepatellar bursitis. A bag of frozen vegetables wrapped in a tea towel is a simple means of providing cold therapy. A hot water bottle wrapped in a towel is an effective form of heat therapy. Alternating hot and cold water from a showerhead is another idea. Painkillers and anti-inflammatory medication such as ibuprofen are also usually recommended. Persistent fluid accumulation in the bursa increases the risk of further episodes of inflammation. Under these circumstances, the fluid may need to be aspirated, and hydrocortisone may be injected to relieve any inflammation and prevent further fluid accumulation. If the problem persists despite these measures, surgical excision of the bursa may be necessary. The best way to avoid inflammation of the bursa is to steer clear of any action that causes repeated friction between the skin and patella. In some occupations, such as carpet-fitting, this may not be possible, although it's not unheard of for people to change profession because of recurring knee problems. A bursa is a small sac containing fluid which is responsible for lubrication during movement between bone and tendons. Infrapatellar bursitis (clergyman's knee) is the inflammation of the infrapatellar bursa located just below the kneecap. The deep bursa is situated between the patellar ligament and the upper front surface of the tibia. 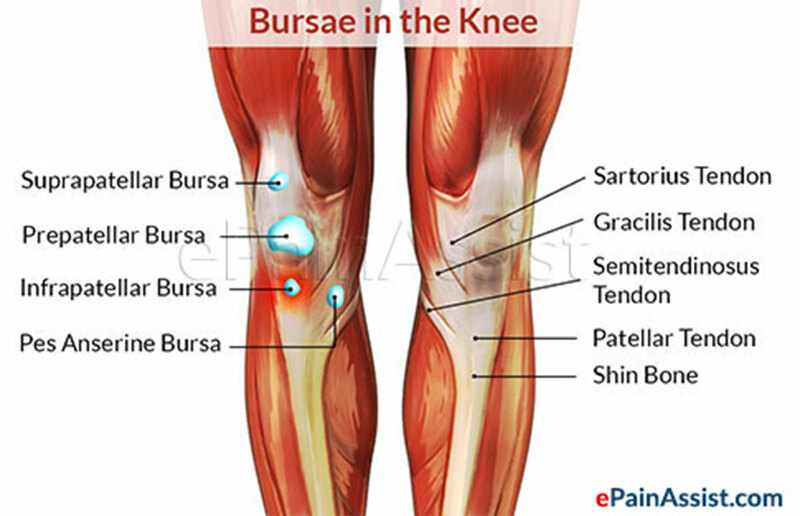 The superficial bursa is located between the patellar ligament /patellar tendon and the skin. Friction or chafing between the skin and the bursa results in infrapatellar bursitis. This may sometimes occur along with Jumper's knee. Pain in the anterior region of the knee. Swelling in the region of bursa. Pain can be similar to that of jumper's knee. Direct pressure on the knee should be avoided such as when kneeling. Cold therapy helps in reducing the pain and swelling. Compression helps in reducing the pain and swelling. Anti-inflammatory medications such as ibuprofen help in pain and inflammation. If patient does not benefit from conservative treatment, then aspiration of the fluid from bursa can be done along with an injection of corticosteroids into the bursa. If all fails, then surgical removal of bursa is done as a last resort.